Lewis Benson suffered the first defeat of his professional boxing career in Belfast but revealed he has been able to draw on the positives. 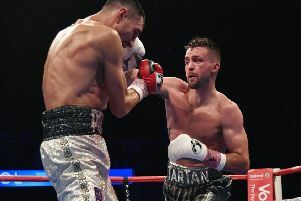 The 26-year-old Capital welterweight was aghast at the judges’ decision to award a gruelling ten-round bout 96-95 in favour of undefeated Englishman Johnny Coyle in the Northern Irish capital on Saturday night. However, Benson, who represented Scotland at the 2014 Commonwealth Games in Glasgow, is adamant he will not allow this minor setback to undo all the hard work he and his coaching team have put in these past few months. Having racked up ten consecutive wins since joining the paid ranks with MTK Scotland in summer 2015, Coyle (now 19-0-1), was just the calibre of opponent Benson had craved. And, having recently switched promoter to MTK Global, the former Scottish and British champion got his wish at the SSE Odyssey Arena – a duel that was broadcast live on BT Sport and BoxNation. “I don’t consider this a loss as I see it more as a learning curve. I didn’t get the decision I thought I deserved but you live and learn. The fight will do a lot for my career moving forward,” Benson said. “That’s what I’m in this game for. I’m not here to take easy fights. Johnny Coyle is a tough, tough man so I’ve got a lot of respect for him but I do think he underestimated me. “This is not the end, it’s just the start and everyone could see with my performance that there is a lot in the tank. “I’ve had so many messages of support it has been unreal so I can’t thank everyone enough. 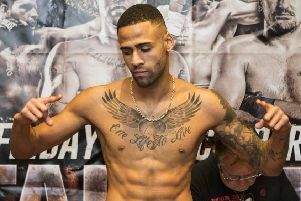 Benson was assured from the first bell and didn’t appear overwhelmed by the occasion, or his opponent for that matter. The Edinburgh fighter enjoyed the better of the opening exchanges but a strong response from Coyle saw the Englishman claw his way back into the latter stages of the contest, which was enough to sway the decision his way.